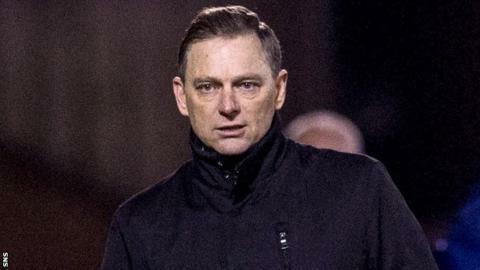 Airdrieonians say manager Eddie Wolecki Black "is now recuperating" after tests confirmed he suffered a stroke during Saturday's win at Cowdenbeath. The 50-year-old was taken ill at half-time and taken to hospital in Kirkcaldy, before being transferred to a specialist stroke unit at Edinburgh's Western General Hospital. The Scottish League One club intend to give Wolecki Black and his family "all the help and support they need to get him back on the road to recovery". Diamonds chairman Tom Wotherspoon added on the club's website: "In the fullness of time we look forward to seeing him back in the job he loves but for now all that matters is his return to good health. "Over the weekend we have been inundated by kind messages of support from throughout the coaching community and Scottish football as a whole that have shown how highly Eddie is regarded. "We would like to thank everyone who contacted us, coaches and players, fans of our own club and supporters of others, and we will pass on all of the good wishes to Eddie in due course." Former Montrose player and manager Wolecki Black had initially joined Airdrie in September as director of coaching and took over as manager when Gary Bollan left to join Forfar Athletic. He was previously head coach of Glasgow City, who won four successive Scottish Women's Premier League titles during Wolecki Black's time in charge and also reached the Uefa Women's Champions League quarter-finals for the first time in 2014.